avoid to profit in the financial market and limit losses. 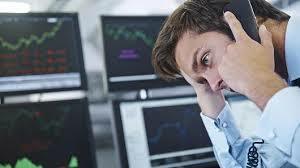 illustrates traders' agony after a gross trading mistake. or sell in a rising channel. In each case, one is violating the market patterns. develop into bearish before one can look forward to a bearish signal. turns bearish. The reverse is also true if one is bullish. The third biggest and forbidden trading mistake is to trade on a solitary period. the resultant medium or the long-term trend is bearish. 4/ and to time the trade precisely. the trade at the right time and place. trading signal and third for the low risk entry point. the trading setup on a higher time frame. and demonstrates what is a multiple-time-frames trading method. Watch in full, rate and share this unique trading video today. when sharp market participants stay way. market atmosphere is out of place. than those who buy around mid-February. The fifth biggest trading mistake is the mishandling of a technical indicator. Channel Index and the Relative Strength Index oscillator. are not competent in technical analysis. It is alarming for the reason that one is using trading tools that one does not grasp. most traders time and again sell securities just because the stochastic is overbought. instead of focusing on bearish signals because the stochastic oscillator is oversold. For most beginner traders, it may take a long time before they appreciate the significance of the economic news. Additionally, few may wipe out their trading account before they take note. way of life, and start to pick up at a faster pace. technical analysis with the economic news. to improve. One should always stay away from this trading mistake. trading and investing strategies. Get started.